Sightings of fish kills or suspected harmful blooms can be reported to TPWD's 24-hour communications center at 512-389-4848. For the status of shellfish harvesting areas, please contact the Texas Department of State Health Services at 1-800-685-0361. Algae are microscopic plants that are usually aquatic, single-celled, and lacking true stems, roots, and leaves. Algal blooms occur in both marine and freshwater environments when a species of algae reproduces rapidly. A bloom may even discolor the water due to the large number of algal cells. 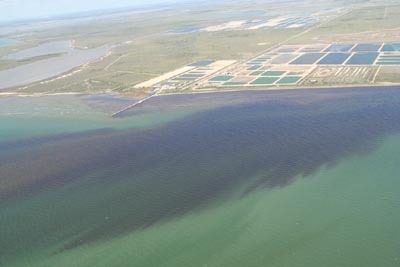 A harmful algal bloom (HAB) is a bloom that produces toxins which are detrimental to plants and animals. Blooms can be caused by several factors. An increase in nutrients can cause a dramatic increase in algae growth and reproduction, just as fertilizing a lawn makes grass grow faster. Or there may be a change in water temperature, water quality, amount of sunlight, or some other environmental factor that gives some algae an advantage over other species of algae, which can result in a bloom of the algae that have the advantage. 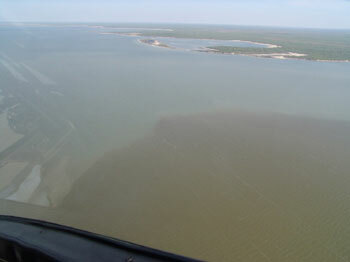 Are red tide and golden alga blooms the same? Both are caused by harmful algae, but different species are involved, and the toxins differ in their composition and mode of action. Fish and shellfish that are contaminated with red tide toxins can cause illness in humans and pets. Swimming in red tide-infested water may irritate skin, and breathing airborne toxins can lead to respiratory problems. Golden alga toxins affect only gill-breathing organisms such as fish and shellfish, and there is no evidence that they present a direct threat to humans. However, it is never a good idea to collect dead or dying fish for consumption. Species that cause red tide blooms belong to the group of algae called dinoflagellates. They are single-celled algae with two whip-like flagella, one in a central groove and another placed vertically. The golden alga is in a different family called the Chrysophyta. It is a tiny single-celled organism with yellow-green or golden-brown pigments. It has two whip-like flagella and a third appendage called a haptonema used to attach to other objects. Who responds to Harmful Algal Blooms? Texas Parks and Wildlife Department has a Kills and Spills Team (KAST) that responds to an incident where fish or other animals have been harmed. These specially trained biologists collect water samples for analysis, record water quality and environmental data, and identify and estimate numbers of dead wildlife, among other tasks. They contact other agencies and personnel, including Texas Department of State Health Services if human health issues are suspected, Texas Commission on Environmental Quality for impacts to natural resources, and the governing authority that manages a particular area. TPWD monitors harmful algal blooms as they progress and communicates with the public through the agency website and social media accounts. The county, city, river authority or other agency in charge of an affected area is responsible for cleanup of dead wildlife. The term alga is used when only one species is being referenced. 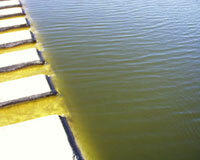 If the discussion is about several species (or a group of species) then the term algae is used.